Love a Duck is a dingy looking (inside and out) Chinese restaurant in Northcote that I hadn't been to for years until this evening. They were very busy and rightly so, since the food was pretty good. 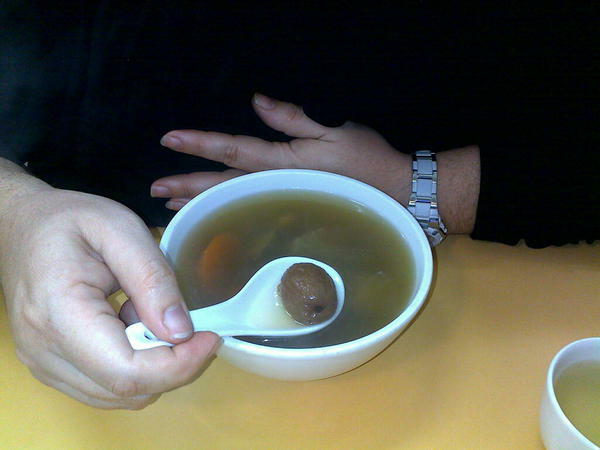 Jane started with the $2 soup of the day that, despite not knowing what half the contents were, enjoyed. We had the roast duck with vegetables and the duck was tender and lean. We accompanied this with a Chilli Chicken with Peanuts and Bamboo shoots dish that had nice and tender chicken although I was not particularly fond of the chilli tomato flavouring. We would return.